My wife and I watched the Olympic opening ceremony with our four-year-old. She was excited to stay up past her bedtime and was interested in what was going on. She stayed up until the parade of nations began. My favorite comment watching them with her Friday night was during the "Frankie and June Say Thanks Tim" sequence, in which British music and the technological revolution is chronicled in the show. "They Need More Of Those Poppins"
This was in reference to the Mary Poppins that rained from the sky previously to take on Harry Potter's Lord Voldemort and other British villains. The morning after the ceremony I asked her what her favorite part of the ceremony had been. I didn't know exactly what to expect, but I certainly didn't expect her to opine on the interpretation of the United Kingdom's transition from agrarian society to it's current modernized society. In fact, if had to guess I though she might comment on the kids jumping on the hospital beds, or the drumming of Everlyn Glennie which she really enjoyed (and also lead to interesting discussions about how someone who is deaf could still play the drums and feel the rhythm). But no, instead she described her favorite part saying "I liked the part with the girl getting clothes and stuff for college and saving a lot of money." I scratched my head and then realized what she was talking about. I asked "Did the girl have a pink and purple comforter?" She said "Yes, and it was not as expensive as the other stores." Her favorite part of the ceremonies was not during the ceremony at all, but rather a commercial for Ross discount department stores. 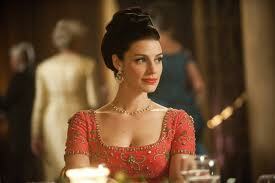 The commercial was probably during one of the first two breaks when her attention was at the highest level. Sorry Danny Boyle, for my four-year-old you were outdone by a low budget commercial for Ross. 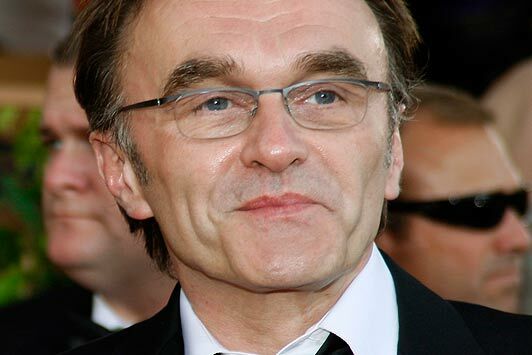 I must admit, I'm pretty excited about Danny Boyle being the director of the opening ceremony of the 2012 London Olympics. I feel like Danny Boyle is capable of having a modern style that is also accessible. It's pretty incredible the traction that Slumdog Millionaire received. I don't think many directors could have taken the novel Q & A and turned into not only an Oscar winning film and one that many people of all ages enjoyed. 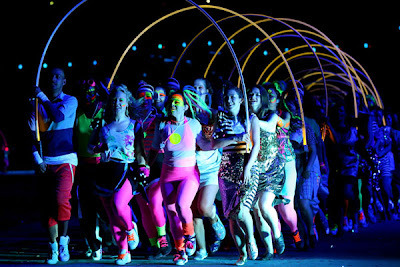 Like Superbowl shows, an opening ceremony of this nature (particularly after the all-out Beijing 2008 presentation) is destined to have naysayers, but I really have confidence that not only will Boyle pull it off, but all the early reports of allusions to British film and literature makes it seem like a real treat. Clearly Boyle will have a different style that Beijing's 2008 director film-maker Zhang Yimou. But I like the idea of film directors directing these ceremonies, especially since the final product is seen by far more people on TV then live in the stadium. An eye like Boyle's could be valuable. Any handful of British directors could have directed the ceremonies, or even people outside of the film industry. For my own enjoyment, here's a list of other living British Oscar winning directors. Can you imagine any of these directors doing the ceremony? I was pretty pleased with the book the Hunger Games, as shared in my post earlier this year after reading the book. (I also enjoyed the movie). Not to my surprise after doing my post on the book (admittedly a little late to the party) I received a handful of comments addressing the second and third books, which in general either noted that these were not as good as the first in the series and that they were important to finishing the broader story. 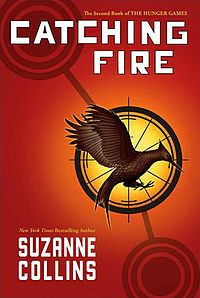 I have just finished reading the second book in the series, Catching Fire by Suzanne Collins. ► Hunger Games was such a dynamic and intriguing book from the first page, I'm not surprised that getting into the second book was a little sludgy. There was the slight time gap from the end of book one, so there seemed like a lot of pressure to help fill in the gaps on the cast of characters. Collins seemed dedicated to catching us up perhaps more than necessary, I enjoy all the characters, but between Madge, people in the Hob, Haymitch, Gale and his family, Peeta and his family, and Katniss' family. It was all just a lot of catch up. ► This book at times, often at times, seemed like an emotional girls diary. I understand how the Gale and Peeta plot device works, and I don't need the main character spending the bulk of the book agonizing over how every moment might impact her ever changing emotional feelings towards her two male suitors. ► Due to issue addressed above ("the boy drama") the first half of the book drags. ► Due to the plot device used that puts Katniss back in the arena with Peeta the second half of the book seems sort of like deja vu. But at the same time is more interesting, just less suspenseful. ► The lack of suspense in the second half of the book is fact that I was pretty convinced that Suzanne Collins was so dedicated to her characters she wouldn't let anyone that survived book one, survive book two. ►In the last 50 or so pages, I found myself finally hooked (a little late), and found myself pretty intrigued with the direction of the book with some sense of surprise in the final set of pages. ► If the film makers can cut out the overkill girl/boy emotional drama, I think that Catching Fire could be a pretty good movie. I'll buy a ticket. I'm cautious to write about the Aurora shooting during the midnight premier of The Dark Knight Rises. Although, there is part of me that feels like this blog space is the place where something should be added to the conversation. You can see how previous post could easily interplay with topics related to this event. Believe me, I don't feel short of angles to discuss, and I've heard and seen some of those angles already discussed. With minimal editorializing, particularly with limited details being released, I'd prefer to catalog the topics that could be discussed here. The Connection Between Film Content & Events. Believe me, I think this conversation will continue to come up. 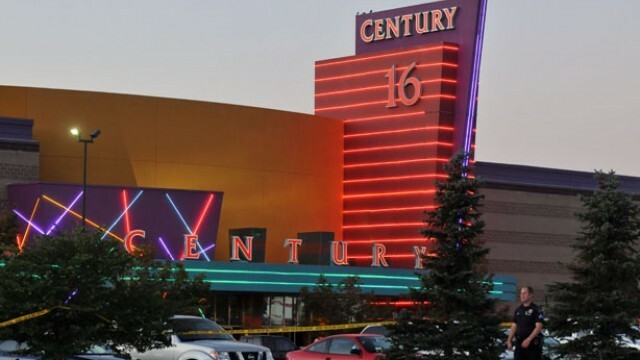 If the shooting occurred in a midnight showing of The Great Gatsby or The Exotic Marigold Hotel, that would be a different matter, but regardless of what the suspected perpetrator James Holmes had in mind, there was some related film connection. I feel like it's way to early to speculate much further, even with news reports and eye witness reports regarding Holmes referencing himself as the Joker, or his potentially red-dyed hair for the massacre. The conversation will undoubtedly continue to be connected to the film itself, as well as it's content. One of the things I have praised Christopher Nolan for doing in Batman was making his mentally deranged criminals believable, and had previously compared the Joker character to anthrax killer Bruce Ivans. It is truly tragic that there is even any room for comparison to criminals in these films and real life. The Violation of Entertainment Space. People go to movies to escape, relax, and hide out for a couple hours in dark room surrounded by intentionally invasive sound and moving image. Yet, the element of fear in the public space is one that surely is part of the past decade since school shootings such as Columbine (1999) and fears of terrorist attacks associated with major sporting events. It's one thing to worry that a punk kid behind you will throw their sour patch kids or popcorn at you in the theater, it's another thing to feel like you need to be more aware of your surroundings for your safety. I have blogged at least twice on movie theater deaths, one a health related death with theater negligence in Fort Collins, Colorado earlier this year, the other a suicide during Watchman in 2009. Both these deaths previously were unsettling, but not enough to impact the way I felt in a movie theater environment. This type of event is different in that way. The Impact of Dark Knight Rises Box-office & Theaters. Warner Brothers in the name of sensitivity is not announcing their box office statistics throughout the weekend. And it's hard to say how the shooting will impact the final numbers, and speculation and news stories are sure to try to figure out how to get at these types of details, particularly when numbers are revealed at the end of the weekend. No doubt, this film will still be a huge box office behemoth, but trying to determine the impact of this tragedy will be impossible. Not only that, it will be hard to tell if this might be for some just another reason to stay away from the pricey theaters who's product has become less and less differentiated from the viewing experience people get at home. General Conversations About Violence/Gun Control. It took less than 24 hours after the event for me to notice in my personal Facebook feed a number of people writing defensive posts about their right to guns. Plenty of post saying "Guns don't kill people, people do" and then going on to support that position, or present a disagreement with that position. Males in their Twenties. Whether it's national news magazines or personal experience, I feel like I've heard a number of people talk about the extension of adolescence for males going well into their twenties. I got my haircut yesterday and believe me, a lady there was ranting about how males in their twenties don't know how to have interpersonal relationships, talk to people on the phone, or have a worldview wider than their online social network. Agree, disagree, or find yourself somewhere in the middle, the conversation is coming. Children and Violent Media. Regardless of the target audience for films like The Dark Knight Rises or other violent files (more or less violent), these films are often watched by children. I noticed this when my wife and I watched The Avengers in the theater earlier this year, and were shocked that a father had brought his three kids to the film, including his youngest, a four year old. With a limited victim list reported, the media has anchored to an age range of those who have been hurt or injured revealing a range of 3 months to 45 years old. The 3 month year old listed was hospitalized, but released, but different families have different values related to their media discernment, but an event like this will certainly ignite a conversation. Film Studios Reactionary Sensitivity. As soon as an event like this happens questions arise to how will film makers respond (both Warner Brothers and Christopher Nolan did respond, both with statements and action, in this case, canceling the film premier in Paris). But to me what is even more interesting is that the period film Gangster Squad staring Sean Penn due later this year was a film preview for this movie at some sites. This film preview showed a mass shooting with automatic weapons at a theater, but has now been removed as a film preview associated with The Dark Knight Rises. Part of my interest in this is because it reminded me of a similar event earlier this year with the film Neighborhood Watch (since renamed The Watch) which found similar surprise bad press when it's promotional materials were released just prior to Treyvon Martin's death earlier this yaer at the hands of neighborhood watchman George Zimmerman in Florida. Politics - The Presidential Election : For whatever reason, whether logical or illogical, the media has seemed to grasp onto how Barack Obama and presumed Republican presidential candidate Mitt Romney have responded to the events, either with their typical "our hearts and prayers are with the people of Aurora" statements, as well as there withdrawal from heavy handed politics for the day of the event. There seems to be hardly anything interesting here to discuss with this topic, all the same, the topic is in the air. It seems to be more a media conversation, than something part of the broader public's conversation. Although, depending on how it is played, that doesn't mean it can't shape political discussions at a later date. The Aurora Shooting & Columbine. The events are over a decade apart, but both major mass shooting media events just under 20 miles apart from one another. The conversation will undoubtedly in some circles be on the similarities between these two events, or how these two events have nothing in common. Amy Grant's 12th album, Heart in Motion, including the controversial and popular song "Baby Baby"
As a sub-genre, Christian music is a unique one, because unlike most genres that are based on certain musical styles (bluegrass, country, rap, rock, swing, etc.) the idea of Christian music is one is based on content. As such you get sub-genre upon sub-genre, such as Christian Rock, Christian metal, Christian acapella, and so forth. In fact, a century ago, people in general probably couldn't begin to anticipate what contemporary music would sound like, and be equally surprised that music sub genres would exist that would have loud screaming genres of music that Christian artist would participate in, in the name of their Christian message. As music industry has been progressive in many ways, the Christian industry keeping up with this progressive nature unsurprisingly spurs controversy after controversy. Controversy in the industry can spur from when public-spotlight Christians have personal crisis that creates judgment and criticism (such as Amy Grant's divorce of Gary Chapman in 1999, followed by marriage to Vince Gill in 2000). But more often than not, criticism has often spun from Christian artist achieving mainstream success with vague lyrics that stray from the topical genre. Again, Amy Grant was a key victim of this past couple decade with "Baby, Baby" (1991). but other victims included bands like Jars of Clay ("Flood" 1995), or Sixpence None the Richer ("Kiss Me" 1997). But in the past decade, these type of controversies seem to have subdued and there are a number of artists who's songs cross back and forth between contemporary Christian radio stations and popular radio stations, with little discussion or controversy in the Christian subculture. One of the first artists that seemed to make this transition with limited threatening discourse was Switchfoot who's had an incredible run seem to begin in 2002 when their songs cross over with a significant lift from the release of the film A Walk To Remember. The film, based on the book by Nicholas Sparks and staring Mandy Moore featured three tracks "You" (off their 1997 Legend of the Chin album), "Only Hope" (off their 1999 New Way to Be Human album), and "Dare You To Move" (off their 2000 Learning to Breath album). This cross-over created far less controversy. Similarly, cross over seems less offensive, especially if the songs are openly spiritual, such as Mercy Me's 1999 independent release and mainstream release of "I Can Only Imagine." The song crossed over in 2003 to mainstream radio where it peaked at number 5 on the Billboard adult contemporary charts. Today, songs by artist like Daughtry ("Home"), The Fray ("How to Save A Life" and "You Found Me"), Kris Allen ("Live Like We're Dying") have crossed the other direction from mainstream to Christian radio. And of course, Country music has long blurred this line, with many country songs dealing with the topic of faith in a way that doesn't even make a bleep on the radar of controversy. In general, I find the whole conversation about these things are generally trivial, but occasionally very important. I strongly believe that it is important for Christians to be aware of culture, including the form of media from which they soak up culture, and understand how this impacts them, and their walk with the Lord and their Christian community. On the other hand, most Christian controversies steam from a judgmental attitude in the name of "protecting others" rather than positively impacting ourselves. So when the Amy Grant or Jars of Clay controversies outlined above occurred, the crutch of the argument was not about how songs like "Flood" or "Baby, Baby" where negatively impacting the Christian community (really, how where there?) but about creating something to complain and judge artist about. And perhaps, we've moved past arguments of people being "sell outs" or "too mainstream" in these overarching discussions. Instead the controversies that stir up now are contained to smaller communities more engaged in these discussions or ingrained in the contemporary christian music (CCM) culture. I think of Derek Webb who seems to purposely create controversy based on his libertarian belief and social politics that often differ (and are communicated in ways) that differ with mainstream Christian messages. These discussions are probably relegated to certain smaller communities more ingrained in this culture, then the mainstream Christian radio culture. I imagine these types of controversies will continue, especially as the past decade's progressive and post-modern Christian culture has created another layer to the conversation of faith, culture, the Christian message, and it's delivery. The film is The Assassins (Tong que tai). The Chinese film (previously titled Bronze Sparrow Terrace) is directed by Linshawn Zhao, with a screenplay by Bin Wang (Hero, House of Flying Daggers). Cao Cao was born in 155 in the Chinese city presently known as Bozhou, in the province of Anhui. Born during the Han dynasty, Cao Cao's father (Cao Song) was in the foster child of one of the Emperor Huan's favorite eunuchs, Cao Teng. Cao Cao was known for being crafty and early on a controlling leader. Appointed a district captain of Louyang at 20, he created strict rules for those who violated curfew, and quickly moved up in court until he was displaced after Empress Song was disgraced and falsely accused of witchcraft against Emporer Ling by the powerful eunuchs and concubines.Two years after the Empress Song events (180 AD) Cao Cao became a consultant at court and strongly criticized the power of the eunuchs. 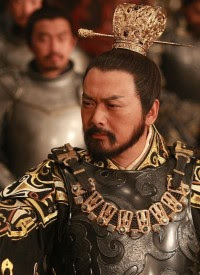 In 184 during the Yellow Turbain Rebellion, Cao Cao was made Captain of the Calvary, was charged with suppressing the rebel movement, successful, but often offensive in area communities for his military dominence he retired in 187 to keep his family safe. He would return a year and half later and was appointed to a military post under Emporer Ling, and then Empress Dowager He. When Emporer Xian was placed on the thrown in 189 with general Dong Zhuo in power, Cao Cao rejected the appointment and left to build his own army in present day Kaifang. In 192 China fell into a civil war when Lu Bu killed Dong Zhuo, which allowed Cao Cao to extend his army and expand military endeavors includes the 193 massacure of thousands of civilians in Xu Province. In 196 Cao Cao joined with Emporor Xian, and became the commander-in-chief. Cao Cao held great authority, including convincing the Emporor to change the location of the capital due to the civil wars. Cao Cao tacticly sacrificed his position as Commander-in-Chief to the powerful northern warlord Yuan Shao, only to result in the Battle of Guandu in 200, where Cao Cao would be the victor, and allow for the unification of Northern China. The divided China continued through Cao Cao's life time, with the Three Kingdom's of China beginning to form with powerful warlords Liu Bei and Sun Quan rivals to Cao Cao. Cao Cao would become the Duke of Wei (213), and later the King of Wei (216), with northern territories under his control, and the three kingdom's growing stronger. In 220 Cao Cao died, and his son Cao Pi took over Cao Cao's post and forced the emporeror to abdicate his reign as emperor, and hand it over to Cao Pi. This ended the Han dynasty and effectively began the Three Kingdom's period in Chinese history. The film takes place in the later years of Cao Cao's life at the time when a bronze sparrow platform was constructed to show his power and he was training up Mu Shun and Lingju to be assassins. In addition to Chow Yun-Fat playing Cao Cao, the two young assassins (and lovers) are portrayed by Yifei Liu and Hiroshi Tamaki. The film also features Alec Su as Emporor Xian, and China's Got Talent judge Annie Yi as Empress Fu Shou, his first wife. As a reflective warlord in anchient China, will Chow Yun-Fat receive his first acting nomination for portraying this Real (Reel) Person? 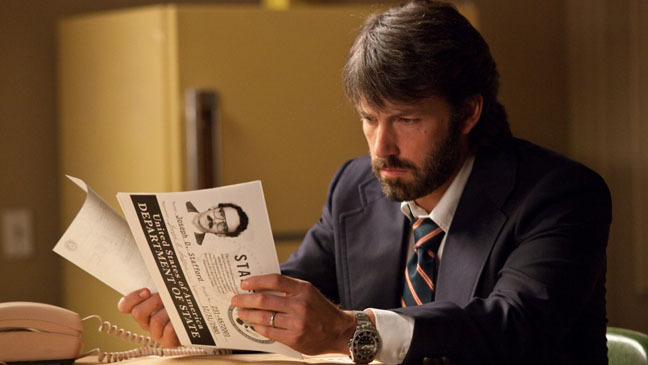 The film is Argo. It is directed by Ben Affleck. The screenplay is written by Chris Terrio (his first feature film) based on an article written by Joshua Bearman for Wired in 2007. Bearman's article: "How the CIA Used a Fake Sci-Fi Flick to Rescue Americans from Tehran." Antonio Joseph Mendez was born in 1940 in Eureka, Nevada. His family of Latino origin having lived in Nevada for many generations, including during the Nevada gold rush. At the age of 14, Antonio (Tony) moved to Colorado, where he would later attend the University of Colorado in Boulder. When he graduates he become a plumber and an illustrator. A unique help wanted ad ends up being a unique CIA recruitment effort. Mendez, an atypical recruit was recruited for his artistic skills and would work primarily with the Office of Technical Service. His specialty was helping use disguises to get people out of challenging situations with radical transformations as well as forging foreign documents. Tony was deeply involved in the Cold War and Vietnam war, but his CIA experience that is most frequently discussed is what is often called The "Canadian Caper." On November 4, 1979 the American Embassy in Tehran was taken over by militants, and 52 American's were held hostage for 444 days. On that first day of the take over, 6 American's evaded capture Robert Anders, Mark J. Lijek, Cora A. Lijek, Henry L. Schatz, Joseph D. Stafford, and Kathleen F. Stafford. After a few days on the road, Anders contacted a friend at the Canadian embassy John Sheardown, who began to help the Americans at great risk to Canada and Canadians in Iran. The American's split themselves between the residence of John and Kathy Sheardown's home in and Canadian ambassador Ken Taylor. Both lived in northern Tehran. Tony Mendez was pulled in by the CIA, and he and the Canadian government began to work together to devise a plan to get the 6 Americans out of Tehran. The risk of compromising the embassy hostages was very high, and Mendez was pulled in to assist. After some failed concepts that would minimize the 6 American's presence, an alternative plan was devised in which a Hollywood film team would be scouting movie shooting locations, including Tehran. Mendez pulled in John Chambers, an Oscar winning make-up artist (Planet of the Apes) and regular acquantance of Mendez. Chamberlin would assist, and had the perfect script. He recommended an adaptation of the science fiction film based on Lord of Light by Roger Zelazny. The options for the film had been recently purchased by Barry Gellar. Gellar had planned on making a theme park in Aurora, Colorado in association with the film with significant help from Jack Kirby (who had drawn a number of concept drawings) but the plan busted due to loss of funds from an embezzlement scandal with in Gellar's company. Mendez and Chambers used the production drawings and script concepts as concept work for their own production of the film which would be called Argo and produced by a fake production company that they built out in Hollywood called Studio Six Productions. With the blessing of Jimmy Carter, fake passports made by the Canadian government, and well designed plan, and documents and costumes delivered through the Canadian diplomats, Mendez went to Tehran to execute his plan playing the part of producer. Despite some potential challenges with Joe Stafford's failure to play his part, the hostages made it out of Tehran on January 27, 1980 and were brought back to safety as they flew to Zurich, Switzerland before returning to the United States. Mendez is now retired from the CIA, and is on the board of directors (along with wife Joanna) for the International Spy Museum in Washington DC. He has also written two books: The Master of Disguise: My Secret Life in the CIA and Spy Dust: Two Masters of Disguise Reveal the Tools and Operations That Helped Win the Cold War (Mendez co-authored Spy Dust with his wife Joanna). In the 2012 film Argo (not the fake film used to help the hostages escape) Ben Affleck directs himself as Mendez. John Goodman plays the part of John Chambers. Other cast includes Alan Arkin, Bryan Cranston, Kyle Chandler (as Jimmy Carter's chief-of-staff Hamilton Jordan), Clea Duvall, Chris Messina, and Victor Garber (as Canadian ambassador Ken Taylor). The film depicts the events associated with Tony Mendez and the mission to help the 6 American's leave Tehran. Ben Affleck's only Oscar nomination (and win) has come from co-writing the script to Good Will Hunting with Matt Damon. Although, as a director, his two previous feature length films Gone Baby Gone and The Town have earned traction in the award season, particularly for their supporting actors. Will the story be different with Affleck directing a historical biographic film? Will Ben Affleck receive his first acting nomination (or perhaps his first directing nomination) for portraying this Real (Reel) Person? Margie Cracken is a guest blogger for StrangeCultureBlog.com, her style & taste are not typical to the Film Blog Community. You can read more about Margie here. I don't think I've ever seen a movie with Dwayne Johnson in it before, but I remember seeing him on The Ellen Show. I thought he was so funny, he did these little dances with her. Now, I will tell you right now, I am not a science fiction fan. I remember back in the day when Star Wars came out in the movie theaters and I was certainly not the slightest bit interested. I'm still not interested today. I've never seen one of those Star Wars movies in my life. Even though this movie is very science-fiction-like I find it very refreshing. I could have done with out the giant bee chase, golden volcanoes, treasure maps, and giant electrical eels. Still, it reminded me of the type of movie I loved to watch with my son when he used to live at our house. I already called him today, and told him that he would just love this movie. In fact, I just love that this movie encourages reading. If my son was still a boy, I would watch this movie with him, and we would go to the library and check out all the books that they mentioned in the movie such as Treasure Island, Gulliver's Travels and some book by Jules Verne, I can't remember what it was called. These are not the types of books I read, but you know the way boys are and their interest in adventure, pirates, treasure maps, and secluded islands. Now, I must say, I found the kids in this movie a little bit obnoxious. The boy in this film obviously needs a father to keep him on the straight and narrow. The boy is far too independent for his own good. His mother has no control over the boy. My son certainly wasn't perfect, but I would have never allowed him to talk that way to me. 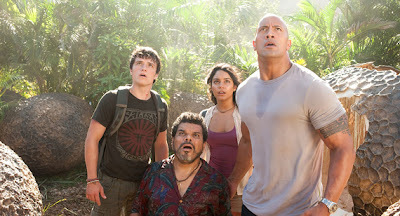 When it comes to father's that Dwayne Johnson guy seems like a real crack-up. Who wouldn't want Dwayne Johnson to be your dad. I realize, he was the step-father, but I was not surprised when we meet the boys real dad (I think the boy's name was Sean), that we see that his real father is completely unreliable and unfit for parenting. You can tell that movie studios these days have gotten sloppy in their grammar skills. 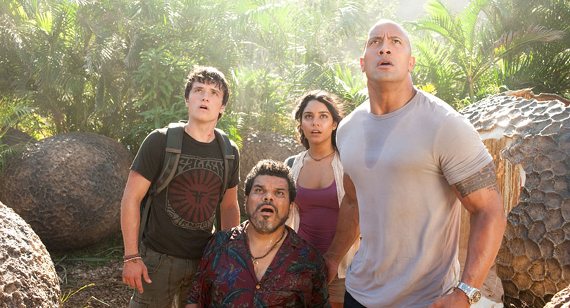 The film's title should clearly be "Journey to the Mysterious Island." But whoever wrote the title clearly must be in to that new text messaging thing since they used a number instead of writing out the word "to." Obviously, they do not understand that while those words are pronounced the same, one is a number while the other is a preposition. Words that sound the same but have different meanings are called homophones. Even though I like this movie for his literary roots and Dwayne Johnson being so funny, there is no excuse for sloppy grammar. Fourth of July is an interesting holiday, and knowing how to celebrate it is often challenging. I shared this thought a few years back. Over the past couple of years we have returned to my wife's hometown and enjoyed a small town fourth of July celebration, which to me is the best way to go to get in the spirit of the holiday, including my appreciation of small town Independence Day Parades. With kids who aren't quite yet school age, fourth of July also means staying up past their bedtime. Way past their bedtimes, since it needs to get dark before the show begins. And by the time it's over you're sweaty and smell like a rank mixture of sweat, bug spray, sunscreen and smoke. This year, we live in an area of the country in a severe drought, the result. No fireworks. None in the local area, none shot off illegally from neighbors homes, nothing. (Side note: Maine residents are in the reverse situation, this year is the first year in decades that fireworks are legal for residents in Maine). So with the ban in place, the sun has not yet set and the kids are asleep. Since my four year old was asking about fireworks all day we settled for an alternative fireworks display. We watched the 2012 Disneyland show (thank you Fantasmiceddie24 for uploading). Despite being a lousy substitute for the real thing, we turned off the lights in the room and watched it on the iPad the kids loved it with plenty of "ewws" and "awws." 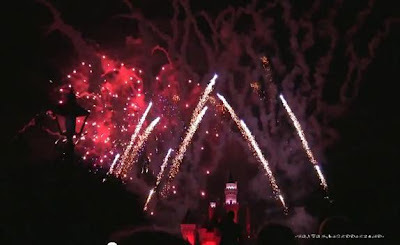 Not to mention, you get Sleeping Beauty's castle in the background. You can enjoy the show as well. Happy Fourth. So...is Megan Calvet (soon to be Draper) just the thing of season finale's? Is she here to stay? And while Season 5 had it's highs and lows, the reality is, not only was Megan Calvet here to stay, but she was a central figure in the season as the main female lead displacing regular women co-leads Betty (January Jones), Peggy Olson (Elisabeth Moss), and Joan Hollaway (Christina Hendricks). While each of those women have strong moments and episodes, no female is as consistently as involved as Megan who whether at home, in the office (or even on the road at a Howard Johnson's), shows up more regularly, and helps us see sides of the 40-something Donald Draper (Jon Hamm). I must admit, I was skeptical, but Megan allowed Don's character to change (less women, softer, occasionally less driven at work, more insecure). The final episodes of the season hint that perhaps some of these new qualities of Don might vanish into Season 6 as he has revived interest in catching the big fish at work, and the final moment shows him at a bar approached by a woman, and his response seems like he might be interested. A subtle response, but one that surely gives Mad Men writers some leverage with Don into season 6. So with that, Megan has added something to season 5 I could not have expected, and certainly the season 4 finale proposal was a brave choice by writers, that I believe paid off into the new season. So with that, a few Megan memories from Season 5. I was so excited to see this past year's best picture winner and have been waiting for it to come out on DVD. I haven't been to a movie theater in ages, but my hairdresser said I would just love this movie. Well let me tell you something, you might not know. This film has no words. They should tell you that before you check it out. I went to the video rental store, and picked up a copy took it home and thought I had a bad copy. I could hear the music, but no talking. So I ran up to the store and told them I thought the copy was bad. The young man working behind the counter gave me another copy. Which, by the way, why do the video store employees all look so awful. This guy had a strange tattoo on his arm, piercings in his ear, and a head of hair that looked like it hadn't seen a comb in ages. I brought home the second copy, and still the same problem. I almost canceled this weeks column, and when I told me son, he laughed at me and told me the film was a silent film. He laughed at me, which of course, wasn't nice at all. I didn't realize they still made silent films. This film must be very low budget, not only does it have no words, but also is in black and white. Speaking of low budget, there is hardly anyone famous in this movie. Mostly they just have that obese man from the TV show Roseanne in this movie, John Goodman, and some other people you've never heard of before. I started watching this movie after dinner and my eyes were tired so I didn't always read the title cards, so I really don't know much of what this movie is about. 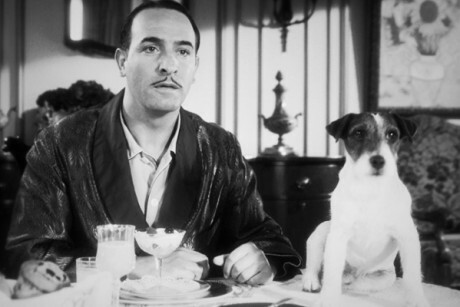 The dog was cute, and I think I'd rather have preferred this movie if there would have been some talking and been in color.